CHARLOTTE, N.C. (AP) The Charlotte Hornets keep finding ways to win at home. Now if Dwight Howard and his teammates can figure out how to win away from Charlotte they might become a very dangerous team. 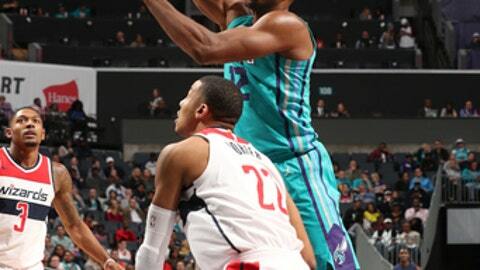 Howard had 26 points and 13 rebounds, including a key block at the end of regulation and a crucial offensive rebound in overtime, in the Hornets’ 129-124 victory over the Washington Wizards on Wednesday night. The Hornets improved to 7-2 at home. But they’re still below .500 overall because of a 1-7 road record. There was plenty of energy in the Spectrum Center as the Hornets rallied from a 9-point deficit with 3 1/2 minutes remaining in regulation to force overtime. The Hornets battled back behind the gritty play of Kemba Walker and Jeremy Lamb, who each finished with 24 points. Walker made a driving layup with 17 seconds left and then added two free throws with 2 seconds remaining to tie it. Howard blocked Beal’s baseline jumper at the end of regulation to send the game into overtime. Charlotte carried the momentum into the extra period with Walker knocking down a leaning 3-pointer from the top of the key after a scramble for a loose ball. Lamb followed with a block and a coast-to-coast layup for a 5-point lead. Michael Kidd-Gilchrist added a driving layup and Lamb buried a jumper from just beyond the foul line to push the lead to six with 1:24 remaining. But the big basket came when Howard grabbed air-ball from Lamb out of the air and laid it in to beat the shot clock. Wizards: Shot 11 of 33 from 3-point range. … Were outrebounded 31-19 after halftime. Hornets: Scored 129 points against a Wizards team that had allowed 100 points in just one of their previous seven games. … Made 15 of 17 foul shots in the first half and 33 of 40 for the game. BATUM RE-INJURES ELBOW: Hornets guard Nic Batum left the game in the second quarter with a left elbow contusion and did not return. Batum missed the first 12 games of season with a torn ligament in the same elbow. Clifford offered no update on Batum’s injury. If Batum is unable to go, Lamb would return to the starting lineup and rookie Malik Monk would likely see additional playing time. CAN’T SILENCE THE LAMB: Along with the steal and layup in overtime, Lamb made some big shots for the Hornets with Batum out of the game. That’s become par for the course this year. Lamb is averaging 16 points per game this season, while shooting a career-best 41.3 percent from 3-point range. He’s never averaged more than 10 points per game in his previous five seasons and never shot better than 35.6 percent from beyond the arc. Wizards: Host Portland on Wednesday night. Hornets: At Cleveland on Friday night.